As most women of her era, Julia Child had only time on her hands; which is why she was such a good chef. She had all the time in the world to perfect her recipes. If you have a day where all you want to do is be in a house that smells absolutely divine, I urge you to take the time & make this recipe! And NO a crock pot doesn’t cut it!! 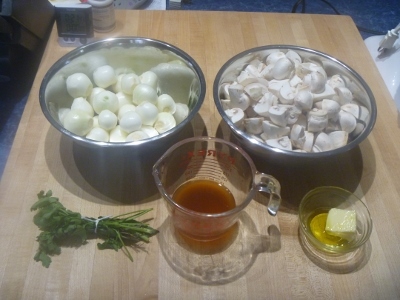 This recipe is written in method format with pictures. All the ingredients are listed in bold only the first time they are used or mentioned. Be sure to read through completely before beginning. Boil 6 ounces of center cut bacon cut into ½” pieces in 4 c. water for 10 minutes. Drain & dry with paper towels. Heat 3 T oil in a large Dutch oven & add the bacon. Cook & stir until bacon is golden brown. Remove bacon to a bowl lined with paper towels (top center). 3 lbs. 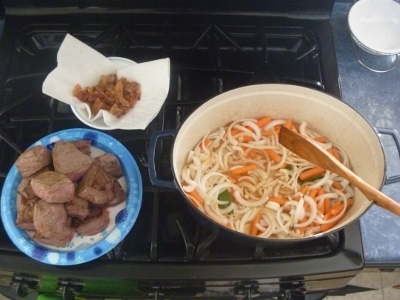 of stew beef cut into 3” cubes, pat dry with paper towels. VERY IMPORTANT STEP! 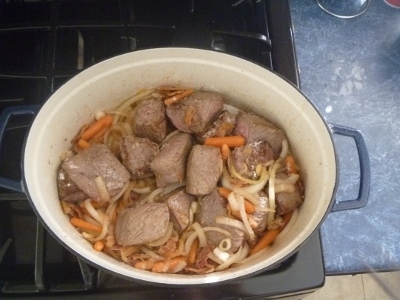 Add the meat to the Dutch oven & sear on all sides. Remove meat to a plate (left). Add to the pot, 1 lg. sliced onion, ½ lb. baby carrots & 2 fresh bay leaves. Cook & stir until browned (right). Return the meat & bacon to the pot with the veggies. Season with a good pinch of course kosher salt & a good grinding of black pepper. Sprinkle with 2 T flour & stir (top). Place uncovered in the oven for 4 minutes. Stir meat & veggies again and bake another 4 minutes (bottom). 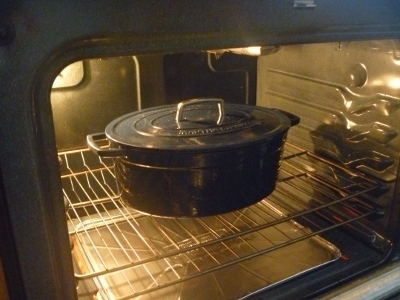 Remove from oven & turn the temperature down to 325°. Remove the bay leaves & reserve. 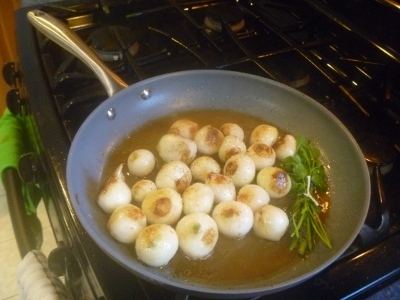 Smash 4 cloves of fresh garlic. Chop 2 tsp. of fresh thyme. Measure out 3 c. red wine. Add 1 T tomato paste, garlic, thyme, wine & stock to the pot. Return the bay leaves to the pot & bring to a simmer (top). Cover & bake for 3 hours (bottom). Peel 20 +/- small white onions. Remove 90% of the root end leaving a little intact to hold the onion together (top). 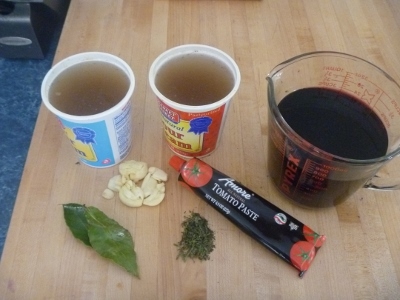 Make an herb bundle of 4 sprigs parsley, 2 sprigs thyme & 1 fresh bay leaf (top). Tie together with kitchen twine (top). 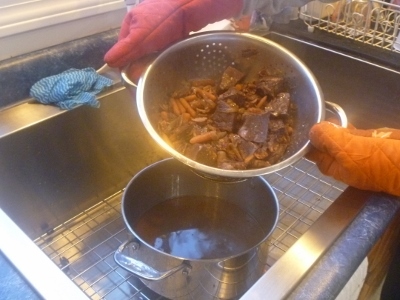 Measure out ½ c. – 1½ c. beef stock (top)….. NOTE: Larger onions require more stock. Quarter 24 oz. 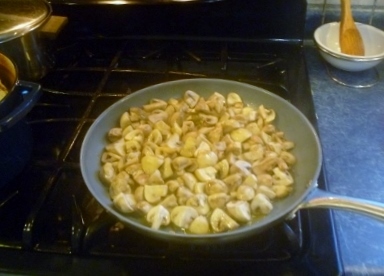 mushrooms (top). 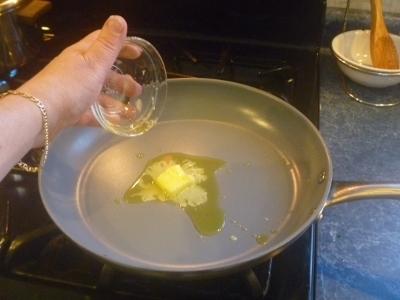 Measure 2 T butter & 2 T oil into a ramekin (top). 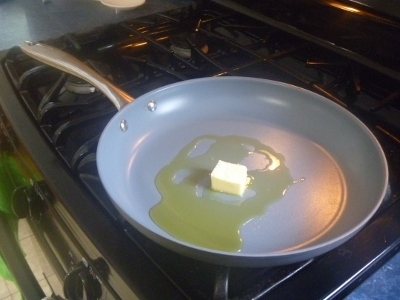 Measure 1 T butter & 1 T oil into a large skillet (bottom). 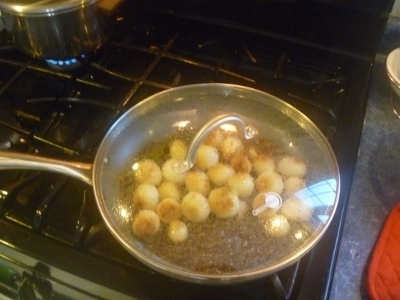 After the stew has been cooking 2½ hours, heat the skillet with the butter & oil over medium high heat until bubbling. 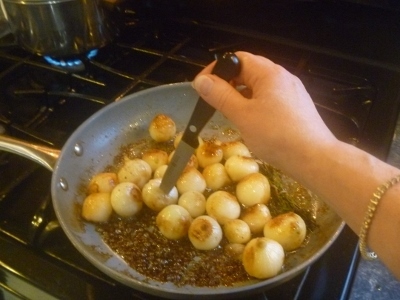 Add the onions: sauté & roll until onions are lightly browned – about 15 minutes (top). 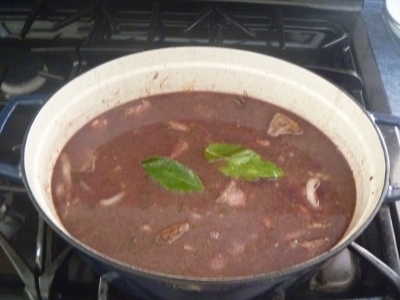 Add the herb bundle & ½ c. beef stock (center). 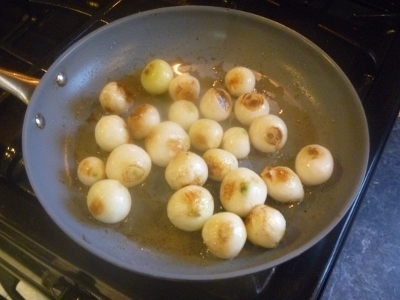 Reduce heat to medium low; simmer until onions are tender and liquid has evaporated (bottom). 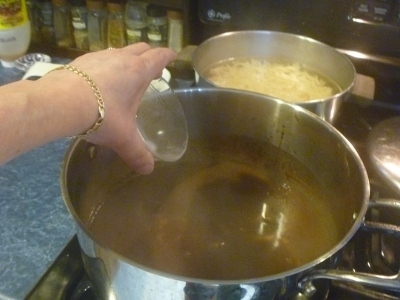 NOTE: This process takes about an hour and you will need to add more stock, ½ c. at a time, for larger onions as shown in the top picture. 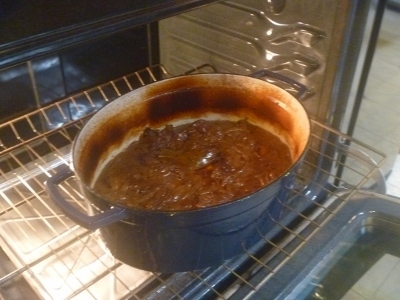 Cover during the last 10 minutes of cooking time to ensure tenderness (top). Pierce the largest onion with a sharp knife. If it goes in easily, it’s done (center). 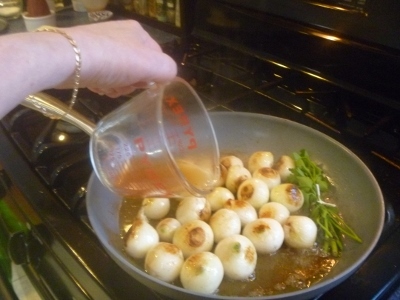 Transfer onions to a bowl & set aside (bottom). 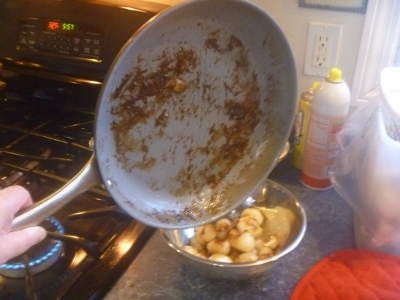 Wipe out the pan & add the remaining butter and oil (top). Heat to bubbling & add the mushrooms (center). 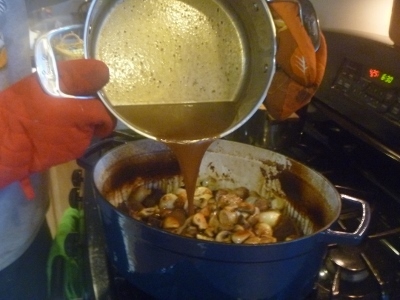 Shake the pan to coat the mushrooms. 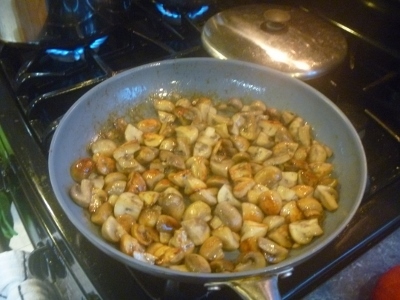 Cook mushrooms over medium high heat for 15-20 minutes or until golden brown (bottom). NOTE: They will give up a lot of liquid. Allow that liquid to evaporate by half. 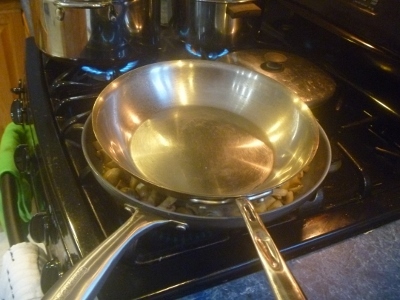 Place a colander over a large pot. 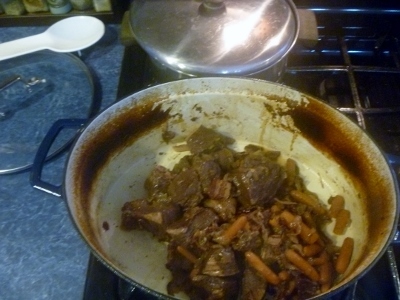 Remove the lid from the stew (top). 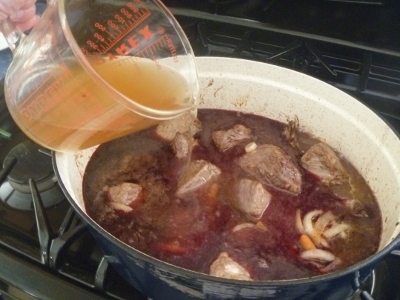 Strain the stew to gather the juices (center). 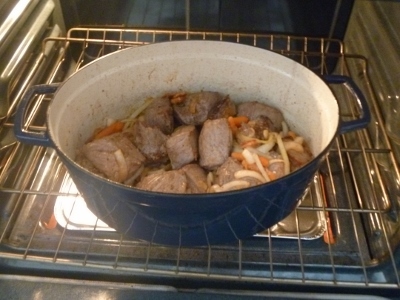 Return the meat & veggies to the Dutch oven (bottom). Place the pot with the juices over high heat. Add 1 c. water & bring to a boil. 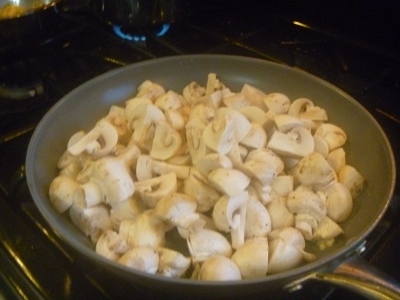 Reduce heat & simmer while finishing the mushrooms. 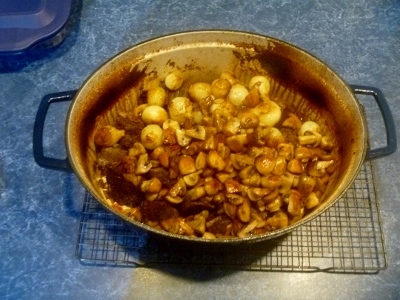 When the mushrooms have achieved their golden brown-ness, place a heavy pan on top of them (top). Cook another 8-10 minutes or until deep golden brown (bottom). Make cornstarch “slurry” with 1 heaping T cornstarch & enough water to make smooth. Whisk the slurry into the juices (top). Add the mushrooms & onions to the meat (center). Pour sauce over all (bottom). 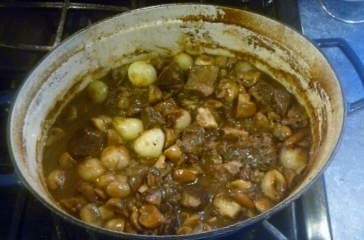 So, after 6 hours, there you have it, Julia Childs’ Beef Bourguignon. 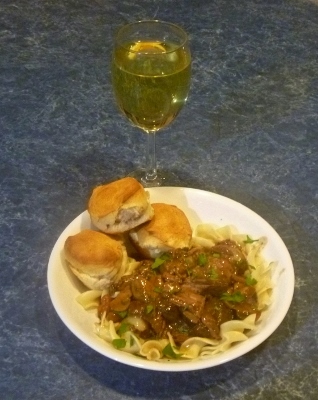 Here it is served over egg noodles with biscuits & a good chardonnay 🙂 BON APPETITE! !